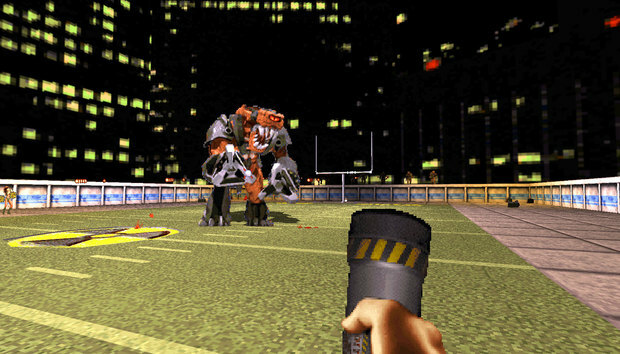 After Friday's not-so-surprise announcement of Duke Nukem 3D 20th Anniversary Edition World Tour, it pretty much topped the list of games I wanted to see at PAX West. Which either means I really care about the King, or that PAX isn't very interesting this year. Not sure. My high spirits even survived the surprise revelation that I'd be forced to suffer through the classic Hollywood Holocaust level with a controller. For whatever reason Gearbox hadn't brought a build ready for the ol' mouse and keyboard. For Duke Nukem 3D. Blasphemy aside, we had an excellent time. It's not exactly a remaster, as we thought. No new textures or anything here. Instead, Gearbox built in a new rendering engine so the environments and shooting take place in true 3D space instead of the faux-3D of the mid-'90s. It's a subtle difference, but one that's noticeable when you toggle the new rendering on and off. Plus it allowed Gearbox to add new lighting effects, for a slightly more modern touch. Also new, at least for PC: The "Rewind" function, lifted from 2008's Xbox 360 version of the game. When you die you can scrub the game back to an earlier point of your choosing, not rely on quicksave/quickload. If you want. Or you can be an elitist and look down on anyone who uses the Rewind feature. But other than that, this is the same old Duke 3D. Same weapons, same enemies, same secrets, same insane par times, same Jon St. John (though re-recorded, so you can hear every bit of depth in his "Hail to the king, baby"). Look for it October 11. Just, please: Don't play with a controller. I'm begging you.